Today FACES had the exciting opportunity to spend some time with President of Lambayeque region, Dr. Humberto Acuna Peralta. President Acuna, who had just returned from a trip to Lima, talked with the team at length about regional social service programs, health care, education and the FACES cleft lip and palate campaigns and follow-up care. The alliance with the Lambayeque regional government is an important one, as FACES hopes to build a truly locally sustainable program, which will become more possible with the integration into the government. President Acuna agrees with this point, and suggested FACES and the government formalize the alliance so that the campaigns and health programs can have the greatest impact on the most needy, indigent populations around the entire region. FACES prides itself on its long-term care for patients. Cleft lip and palate patients receive this necessary surgery from the team, but they also receive continuing care for months or years to help them rehabilitate and integrate back into their communities. 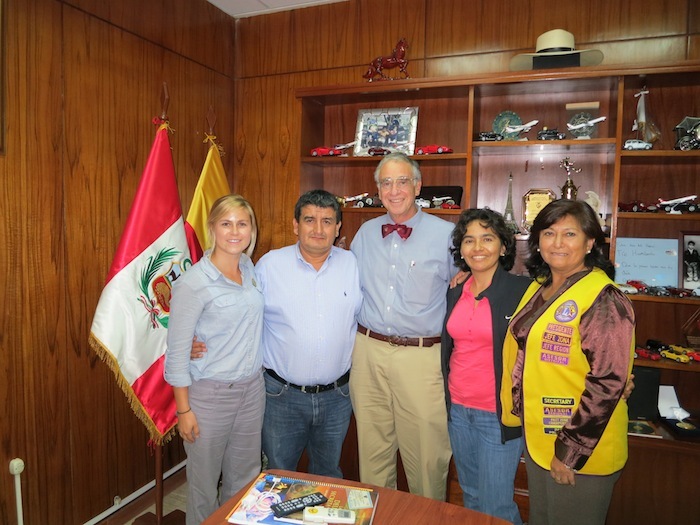 President Acuna thanked the FACES team for their work in Lambayeque region and had ideas for how to expand the FACES reach through academia and technology. “Everything is possible, if we work together,” he said with a grin. From left, Leah Olson, President Acuna, Dr. Tom Albert, Delia Delgado, and Teresa Bancayan.